1. 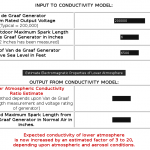 The detailed observation of unusual airborne filament samples that the U.S. Environmental Protection Agency has refused to identify over a period of many years. 2. 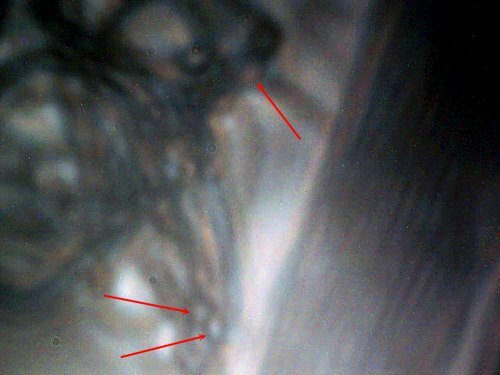 The morphology, or structure, of unusual filaments that are characteristic of the MORGELLONS’ condition. 3. 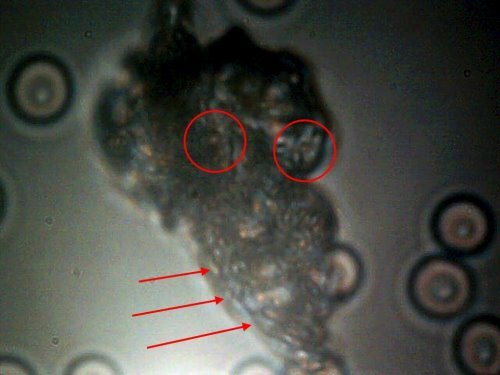 The recent discovery of anomalies in a series of observations of human blood samples, one of which is from an individual that manifests advanced symptoms of the MORGELLONS’ condition. This research remains at an early stage of investigation. The work will be presented without delay because of the implications should these discoveries prove to be accurate. The finding here is that there is essentially identical form, size and structure between the airborne filament samples that have been reported on extensively over the years in connection with the aerosol operations, the morphology of at least one characteristic Morgellon’s fiber and with a series of blood anomalies that have recently been documented. There are now major considerations before us because of this. 1. High magnification images of a representative Morgellon’s fiber will be presented. 2. High magnification images of blood anomalies are to be discussed. 3. 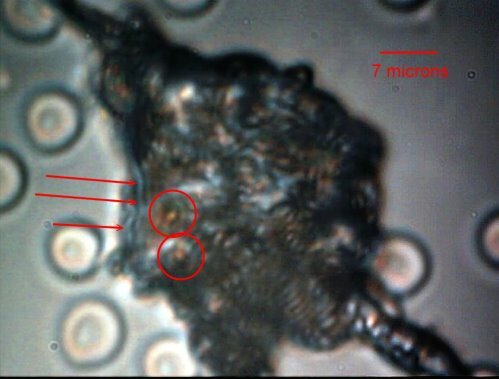 High magnification images of the original airborne filament sample that was sent to the U.S. Environmental Protection Agency several years ago with a request for identification and analysis on behalf of the public interest and welfare. The EPA refused to identify that sample. It is fair to say that there may be enormous implications ahead of us from this information on this page. The reader may benefit if time can be devoted to investigate the history of these issues as they have been reported on this site(and others) over the years. At least one characteristic fiber form from the Morgellon’s condition contains within it a rather remarkable and extensive sub-micron fibrous network. What appears to be a single fiber in reality is composed internally of a complex network of fibers that is difficult to envision without sophisticated microscopy equipment available. 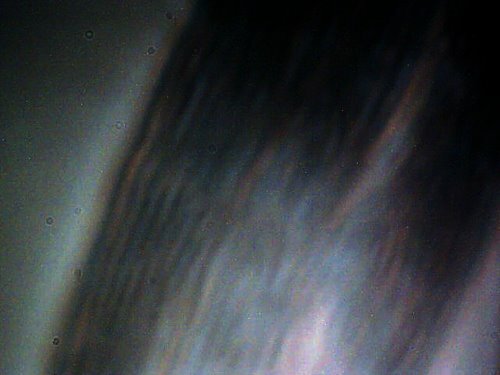 A human hair is on the order of 60 to 100 microns in thickness; these photographs show a network that exists at the sub-micron range. The resolution of the equipment that I have developed and modified is on the order of 0.5 microns, or 500 nanometers; conventional visible microscopy normally peaks out at approximately two microns. Photographs at this level of magnification (2500-5000+) are difficult to acquire. These photographs, although limited by the available equipment, are nevertheless quite revealing. 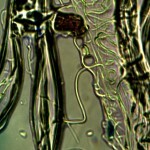 Magnification of Morgellon’s fiber; approximately 5600x. Second, the appearance of a generally spherical micron to sub-micron sized structure is also a discovery during the first Morgellon’s related microscopy session of August 2006. 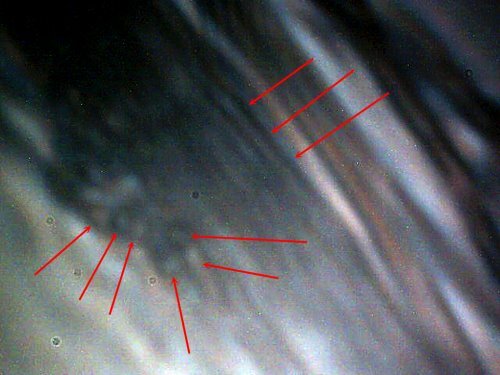 This shows up clearly in the following microphotograph, and the structures are within the boundaries or confines of the encasing filament. These structures measure on the order of 1 micron (viral-bacterial size threshold). Complex internal nature of the original Morgellon’s sample fiber is evident. The purpose of the August 2006 work was simply visual examination motivated by a dearth of information over a period of several years. This deficiency extended to include all public service and governmental health agencies, as well as non-profit organizations that purported to serve the public welfare. Attempts at foisting a diagnosis of delusion eventually capitulated to the mounting evidence and widespread onset and distribution of the Morgellon’s condition. Further details on the assessments as of August 2006 are available by reading the referenced paper, Morgellons: First Observations as mentioned previously. 1. There appears to a remarkable coincidence of form and similarity between the internal structure of the Morgellon’s skin fiber and the anomalous form in the blood of the same individual. 2. In addition, the spherical or circular micron to sub-micron structure is again repeating itself within the invasive structure. Both the fiber network and the smaller internal structures are emphasized with the arrows shown on the photograph. The conclusion at this stage is that there appears to be a remarkable similarity, and quite likely origin, between the manifestations of the fibrous network within both the blood and the skin of the Morgellon’s individual. It would seem reasonable to me that the blood of the Morgellon’s individuals should now obviously become a focal point of further research on the condition. Anomalous form within the blood of a Morgellon’s affected individual. Sub micron network of fibrous structure becomes apparent. internal morphology of the skin fiber from the same Morgellon’s individual. Blood of the Morgellon’s individual becomes a focal point of investigation at this point. Second anomalous blood anomaly within the Morgellon’s affected individual. Repetition of identical form and internal fibrous structure. The second set of two microphotographs present further disturbing concerns of the impact of the anomalies upon the blood. In addition, the images here are taken from a person that does not outwardly manifest any skin problems, lesions or fibers associated with the Morgellon’s condition. It should be recalled that the vast majority of all blood samples that have been observed are showing the same anomalous forms. The question of Morgellon’s manifestation may be one of degree, and the general population is not exempt from the discussion that is taking place here. It has been stated that the Morgellon’s condition may have a much broader basis and distribution than we might like to admit or know. There is additional concern on the effect that is taking place within the blood. A section on the border of the anomaly has been photographed; both normal and abnormal cell integrity can be observed. The observation is that the blood itself seems to be undergoing a transformation; the cellular structure appears to be changing to a more fibrous form. 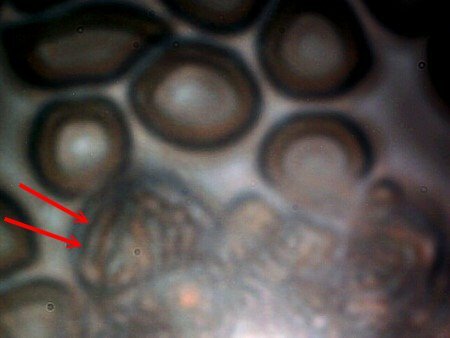 In addition, we see the appearance of spherical structures in the midst of the disturbed blood cells; these structures also appear identical to those reported in both the skin fiber sample and the anomalous blood incursion. Disturbed region within the blood of a “non-Morgellon’s” individual. These same developments occur within the Morgellon’s affected individual. Remarkable transformation of blood cellular structure is taking place. 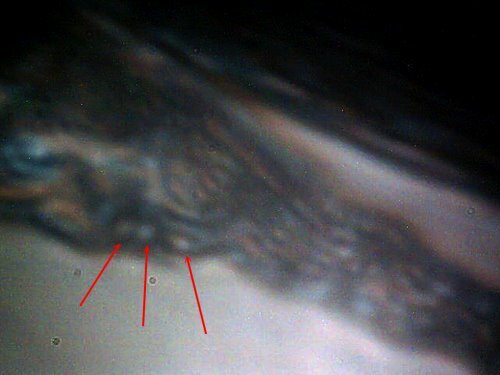 in appearance to original blood anomalies that have been disclosed. Arrows show transformation within the cell to a more fibrous nature. The central disturbed region within the blood of a “non-Morgellon’s” individual. these measure at approximately 1 micron..
Bacterial forms(coccus, streptobacilli) are also under consideration at this stage. The final subject of this paper presents discoveries that I would prefer to not have to report. 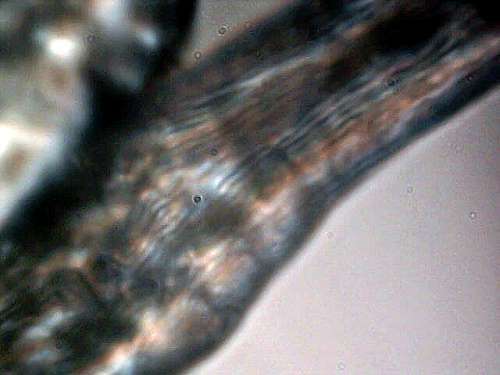 What follows are microphotographs, at much higher magnification than was originally available, of the airborne fibrous sample that was sent to the U.S. Environmental Protection Agency for identification. The EPA refused to identify that sample. The correspondence and history of that interaction with the EPA resides on this site. The results of this study pose a rather serious confrontation for us all. It now becomes clear with the improved imagery over that of several years ago that the airborne fibers have a structure and composition essentially identical to that reported above. This now clearly implicates and questions the role and relationship of the airborne filaments to Morgellon’s and the blood conditions that are currently under research. Unfortunately, we see a sub-fibrous network of the same dimensions as that observed within the Morgellon’s sample and the blood samples. 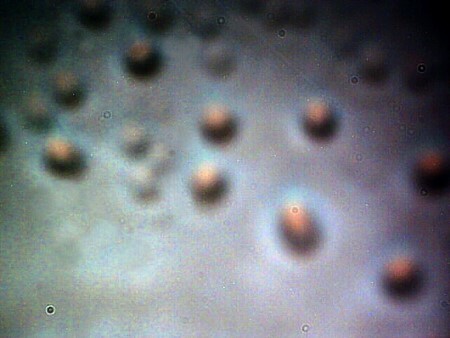 We also see the recurring circular/spherical structures. This establishes a common theme within all three topics of investigation. 1. Environmental contamination of the atmosphere with highly unusual sub-micron fibrous networks which the EPA refuses to identify. 2. The match of the airborne fibrous structure in appearance, size and structure to the manifestations of the Morgellon’s condition..
3 The subsequent similarity to anomalous forms within numerous blood samples that have been observed, one of which comes from an individual with advanced symptoms of the Morgellon’s condition. 4. The effect of all the above upon the health and welfare of the public at large. Highly magnified view of the airborne filamentous sample sent to the EPA. under the separate topics of the Morgellon’ condition and blood testing. Limiting size of internal filaments makes photography difficult. The EPA refuses to identify this sample. Airborne fibrous sample sent to the EPA. Complexity of internal fibrous network is apparent within an encapsulating fiber. What appears to be a single airborne fiber is essentially an infinite network of sub-micron fibers. and similarity to both Morgellon’s and blood testing presentations. 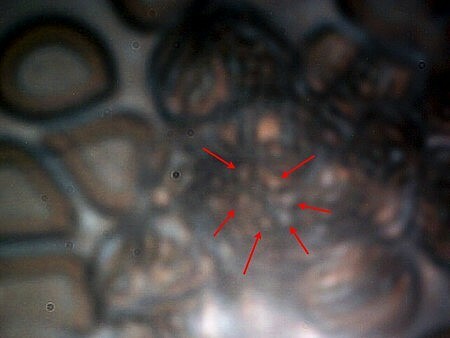 Further evidence of internal sub-micron fibrous nature and circular/spherical structures(arrows). Bacterial (or modified bacterial) forms are a consideration here. Bacterial forms are a consideration here. at high magnification and with stacked images. within and adjacent to the fibrous network. Bacterial forms(coccus) may wish to be considered here. The airborne sample contains these structures both internal and external to the encapsulating fibers. an encapsulating fiber (approx 20 microns in thickness). In summary, this paper presents evidence that there are likely relationships between the original contaminating airborne fibers as reported to the EPA (with subsequent refusal of identification by that agency), the manifestation of compromised health as manifested in the Morgellon’s condition and the detection of certain anomalous forms within various blood samples. I end this paper with, once again, a repeated appeal to those with adequate resources to address the issues that have been raised through the course of research during the last decade. Public, governmental environmental, political and health agencies have failed to serve the public in an extended fashion and the general public and the welfare of the planet is bearing the cost of that denial. I urge you to assume your role. Questions exist as to whether or not conventional biological processes are represented in this study; if so, a division into either eukaryotic, prokaryotic or archaea cell types could be helpful. It is clear that biological processes of some sort are involved. Studies to date (ref. 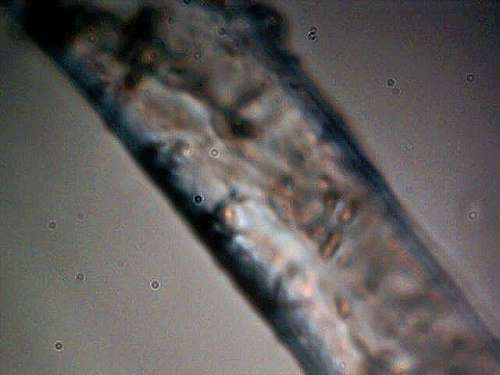 H. Staninger), including this one do not yet identify a eukaryotic cell type; this calls into question the supposition of the filament form as a fungus. It would, however, be reasonable at this time to leave all options available and to investigate them thoroughly; both bacterial (e.g., coccus, streptobacilli) and fungal (e.g., hyphae) forms should be considered as a starting point. If we confine ourselves to prokaryotic cell types, an interesting question is whether or not there are any filamentous (not chains) forms of bacteria. The best progress that I have been able to make on this question is to realize that such forms of bacteria have existed in the past. A reasonable match has been found with a fossilized filamentous bacteria that existed in Australia during the the Precambrian era, approximately 3.5 billion years ago. For an additional reference on this topic, please review Microbiology, an Introduction, Gerard J. Totora, 7th edition, 2001, p 281.